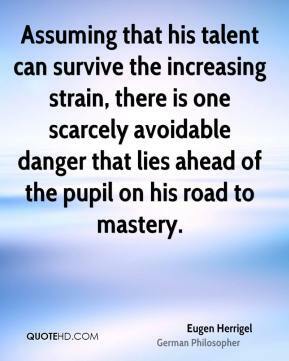 Assuming that his talent can survive the increasing strain, there is one scarcely avoidable danger that lies ahead of the pupil on his road to mastery. 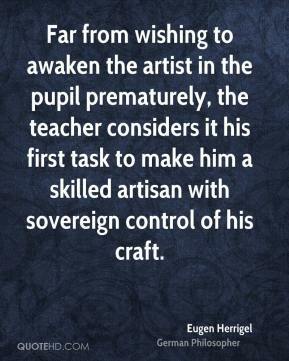 Far from wishing to awaken the artist in the pupil prematurely, the teacher considers it his first task to make him a skilled artisan with sovereign control of his craft. 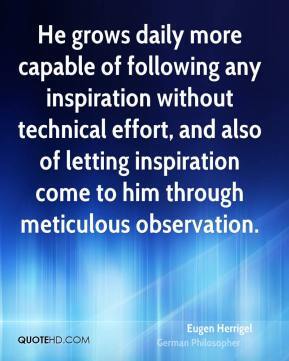 He grows daily more capable of following any inspiration without technical effort, and also of letting inspiration come to him through meticulous observation. 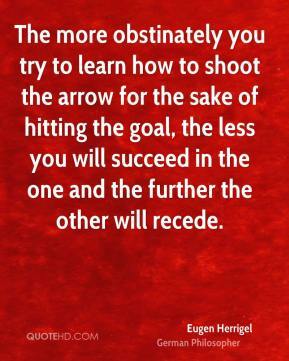 The more obstinately you try to learn how to shoot the arrow for the sake of hitting the goal, the less you will succeed in the one and the further the other will recede.